As I accurately predicted last month, Obama's numbers continued to improve in February. His monthly average job approval rating is up for the third straight month in a row. Even more impressive, this means that in four out of the last five months, Obama's job approval rate has improved. His job disapproval rate was down in February, for the second straight month. All around, Obama continues to improve since his big Obamacare website dip. Congress, as usual, wasn't around much in February, so not a whole lot got done in Washington. Obama entered the month riding on a small wave of goodwill from his annual State Of The Union address, which started him off in a fairly good place in the polling. A report came out from the Congressional Budget Office on Obama's plan to raise the minimum wage to $10.10 an hour, and Republicans spun it as a "job-killer" (no surprise there). This didn't noticeably slow down the Democratic push for the measure, and it certainly didn't change the public's mind either -- a minimum wage hike is still wildly popular. Republicans punted (once again) on immigration reform, exacerbating a long-term demographic problem for them, trading it off for the possibility of short-term gains in the midterms later this year. The big news out of Congress this month, though, was that John Boehner essentially threw in the towel and gave Obama exactly what he asked for -- a clean bill to raise the debt ceiling. Boehner realized (much to the dismay of all the Tea Partiers) that destroying the full faith and credit of the United States was a bit too radical a move for an election year. Obama won this one, hands down. The Winter Olympics took place in Russia, which always generates a certain amount of jingoism in the public at large ("U.S.A.! U.S.A.!! U.S.A.!!! "), which may have benefited Obama a bit as well. Towards the end of the month, Obama started leaking particulars from his new budget. At the very end of February, Russia was back in the news -- but not for a good reason -- as the situation in Ukraine got ugly. For the month, Obama averaged 43.3 percent in the job approval category, and 52.3 percent in disapproval. His approval rate rose a total of 0.6 percent, and his disapproval fell 0.4 percent. This is the first time in his second term he's managed gains in both categories for two months running, it bears pointing out. Of course, in absolute terms those numbers are still pretty bad -- anything below 45 percent approval (or above 50 percent disapproval) is worrisome indeed for any president. But Obama has improved significantly from just a few months ago, when he hit his all-time job approval low (41.4 percent) and his all-time disapproval high (54.0 percent). To put the numbers further in perspective, he still has some ground to make up to get back to where he was before last October (43.9 percent approval and 50.8 percent disapproval). But he definitely was moving in the right direction in both January and February. The overall trends aren't as rosy as simply comparing the last two months to previous months. The trendline weakened for Obama in February, and at the very end of the month showed some troubling signs. This may have been due to the scarcity of data for the month, though. Because the Obamacare website was a significant political event, Obama's polling dropped very sharply last November -- in one month, his job approval dropped a whopping 2.8 percentage points, and his disapproval rose by an even-bigger 3.1 percent. As I mentioned, Obama still hasn't fully recovered from this really bad month. Now, whenever any bad political event happens quickly, the recovery in polling can be expected to be slower than the drop (the reverse is true as well, for quick spikes upwards). But even the rate of change is now slowing. The trendline (or, for those of you who remember high school geometry, the "slope") of Obama's improving poll numbers is flattening. His job approval numbers were up 0.5 percent in December, 0.8 percent in January, but only 0.6 percent in February. His disapproval numbers were not as even, rising 0.1 percent in December before falling an impressive 1.3 percent in January -- but then only dropping 0.4 percent last month. The rate of change is slowing, in other words. That's the first bad news for next month. The second bit of bad news is kind of nebulous right now, so it's really anybody's guess how it'll turn out by the end of March. What we measure in our charts here is the monthly average of Obama's daily "poll of poll" averages posted on RealClearPolitics.com. He started out the month at a pretty good spot in the daily numbers, but then dropped a bit. Mid-month, though, he started to climb again, hitting a high of 44.4 percent. But at the very end of the month, he was down to almost the worst number he posted that month, 42.7 percent. 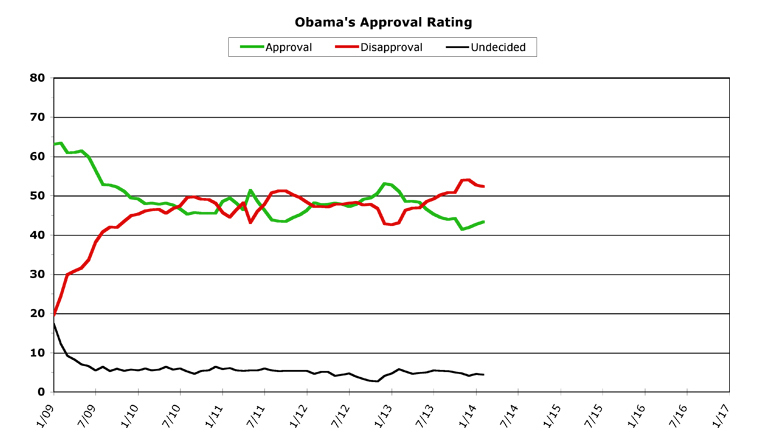 Obama's disapproval didn't fluctuate quite as much, I should add. Part of this was due to a dearth of polling in February. It's the shortest month, obviously, and several nationwide pollsters didn't post any numbers at all in February. Major polling operations aren't on any sort of set schedule -- they poll very roughly "once a month," but it's not like it's "every four weeks" or anything (sometimes they take a break of five or even six weeks between polls). So in February, only three national monthly polls were posted. In January, by way of comparison, nine monthly polls appeared. What this meant was that the weekly polling organizations had more weight, as did the pollsters who operate "rolling daily" polls (Gallup and Rasmussen). This also means a bunch of monthly poll numbers will likely appear in the first week or so of March. Depending on what these polls show, it will set the stage for Obama's daily average for much of the month. So, if the monthly polling is good, Obama can expect to reverse his momentary blip downward and have a pretty good month in March. If the monthly polling in the next week or so isn't great, then it'll tend to weigh him down for much of the month. If this is proves to be the case, then Obama's March numbers will likely flatten out. Indeed, they may even start slipping backwards again. Sorry to be so indecisive in predicting what the trendlines are going to be for March, but things do indeed seem to be in flux. However, one bit of good news was that the first monthly March poll (I'm cheating a bit, here, because to cleanly offer up a prediction for March I would have to not know this already) showed Obama at a relatively good 46 percent approval. If other national monthly polls show similar results, then perhaps Obama will have a third straight good month. But the possibility does exist for him to flatten or even fall back as well. In his big Obamacare website drop last year, the president lost 2.8 percent job approval in a month, and rose 3.2 percent in job disapproval over two months. Obama has now regained 1.9 percent of his approval so far, which still leaves him 0.9 percent short. In job disapproval, his numbers are even worse, since he's only regained 1.7 percent and has 1.5 percent to go. Maybe Obama can manage this in March, and finally put all the Obamacare website rollout bad feelings behind him for good. But, at this point, it is by no means certain he'll manage to do so.